$50,000 to Win at Sebring! 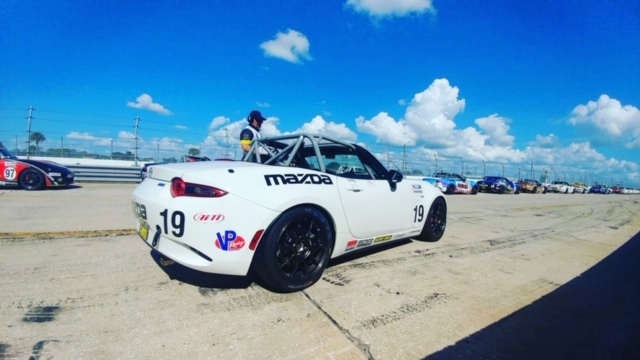 The third annual Mazda MX-5 Cup Global Challenge was this past weekend at Sebring. It’s a non-series race, but there is a big cash payout of $50,000 to win, with a total purse of $80,000. Over 20 racers came from three different countries to participate in the event. Even sportscar standouts such as Andy Lally joined the action this weekend, where we found ourselves in high temperatures that nearly felt like summer. We continued testing and development of the 2019 Global MX-5 package at Sebring. 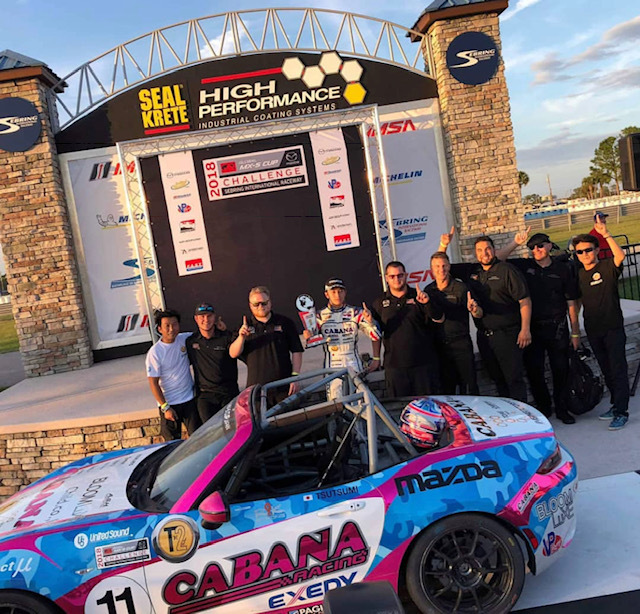 Long Road Racing used this event as an opportunity to continue development on the 2019 Global MX-5 Cup platform. We participated in the test day and the practice sessions to further develop the car, as well as showcase it with the series. It was the first time we had driven the new car alongside the current spec car, and it made us really appreciate how much quicker this 2019 car is going to be. The additional power and extra RPM give it longer legs down the straights, and it really makes a sizable difference that shows on the stop watch. I’m excited to see this platform become the new premier class for the 2019 Battery Tender Global MX-5 Cup Series! As the weekend unfolded, we had extremely close racing (as usual). In the first race, Japanese driver Yuui Tsutsumi took the win on a last-lap, last-corner pass! He participated in this event two years ago and ended up third in one of the races. It was a proud moment for the team and for me, since I was helping coach him. The anticipation was building leading up to the second and final race of the Global Challenge. The top drivers from race one started out running one-two, but several laps into the race, they came together going into turn five. Unfortunately, both were relegated to the back, bringing in all kinds of points scenarios as drivers who finished third, fourth or fifth in race one suddenly had the opportunity to win the grand prize. In the final laps, Nathan Sparks took the lead and won the overall event to take home the $50,000 prize. Next up for the series is the annual MRT-24 Shootout in Phoenix next month, where the winning driver of the invitational event will pick up a $100,000 scholarship for the 2019 season.